Pat Russo read a sign one day that slightly altered his direction, leading to a future of helping many young people alter their direction on a daily basis. Russo’s previous sports experience had been football and baseball. He began training, sparred a couple of times, and then was invited to represent the New York Police Department in a competition against the Fire Department at Madison Square Garden. He won. That was in 1984. After debuting in the sport at the venue of such great fights and fighters, it’s almost as if he had nothing left to prove. But he would box in more amateur competition before moving on after 1992, continuing a successful career in the New York Police Department. Although his competition days ended, he ran the New York Police Athletic League (PAL) amateur boxing gyms. New York PAL eventually discontinued its boxing program in 2010, forcing Russo to find new funding to keep it alive. Fortunately, in 2011 famed professional boxing trainer and TV fight analyst Teddy Atlas was persuaded to provide support through the organization named after his father, the Dr. Theodor Atlas Foundation. Now called the Cops and Kids program training boxers at four different New York gyms—two in Brooklyn and two in Staten Island—Russo is happy it continues and plans to establish gyms in each of the city’s other three boroughs. The Cops and Kids program has repeatedly won the New York Golden Gloves team championships and its Park Hill gym on Staten Island produced 2012 Olympian and undefeated professional light heavyweight Marcus Browne. Russo’s years as an officer were in the 72nd Precinct in Sunset Park, Brooklyn. 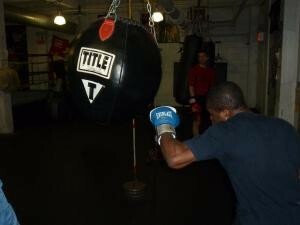 Assigned to the community policing unit, he saw boxing as one answer to the assistance the community was seeking. Police and community leaders agreed that policing was successful in arresting young people who got into trouble but not in reducing the presence of illegal drugs, gang activity, or negative behavior. Teenage offenders were entering the justice system, but not finding alternatives to lead them down a positive path. Russo became Director of Boxing for New York PAL and gyms were opened in every borough until New York PAL discontinued Boxing in 2010. “At that time we had seven gyms throughout the city and two in Brooklyn and I just wouldn’t accept [the closing] and I took over the program on my own,” Russo says. 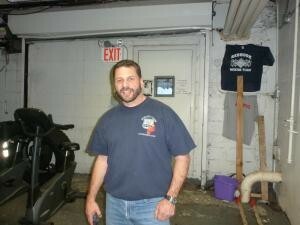 The current Brooklyn gym was started with funds raised from the annual Madison Square Garden Police vs. Fire Fighter competition, making a deal with the landlord of the building to pay only a dollar a year for rent. The financial responsibility became overwhelming, Russo says, and so they reached out to Atlas. “At first he was Leary about it,” he says of Atlas. “He says, ‘This is not really what my foundation does; we take care of sick people.’ And then when he thought about it he says, ‘You know what? This is what my father did. He prevented illness. He would visit people, teach them to eat right and everything. This program does prevention, prevents the sickness of drugs and crime and kids getting into trouble, gangs.’ So he says, ‘All right, I’ll help you. So we partnered with the Atlas Foundation and right now we got three gyms and number four opening up soon,” Russo said in February. With the opening of a new gym in the Brownsville neighborhood of Brooklyn, there are currently two gyms in Brooklyn and two on Staten Island. Opening these gyms has produced great results, and international successes like Browne are a definite goal, but such pugilistic excellence is only part of the package. The prevention of social sickness is the first priority of Cops and Kids gyms. For that reason, a critical element of the program is the tutoring program at each gym. 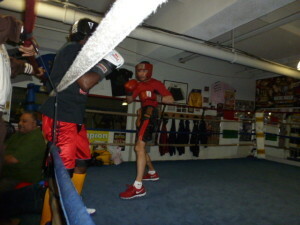 Sarah Deming tutors boxers at the Flatbush Gardens location in Brooklyn. Getting kids into the tutoring room is a challenge, but the ones that utilize this resource greatly benefit. Russo says that during gym hours they average roughly two students per day being tutored in the small study area. Roughly 700 youth come through the Flatbush Gardens gym each year, with roughly 80 remaining as regular boxers who train at least three times a week and roughly 30 who train daily. It’s not unusual for that many people to pass through such a gym in such a large metropolitan setting and the number of boxers training regularly and daily is higher than most gyms can retain. Such dedication is a testament to the high quality of training provided in the program and the continuation of tutoring services further strengthens the endeavor. Demings also works on fund raising, spending time researching and applying for grants to provide equipment and support travel to regional and national competition, which are the biggest expenses. Funding also goes to very moderate stipends supporting volunteers, which at Flatbush Gardens includes Demings as well as trainers Aureliano Sosa, Hilegrio Bracero, Nkosi Soloman, and David Song Perez. Russo says he tries to tell young boxers to concentrate on school the way they concentrate on boxing. One of the greatest benefits of boxing is the discipline involved. Obviously, the reason a much smaller number end up becoming dedicated boxers than those who quit after initially learning is because boxing is difficult. It requires hard physical training and serious mental strength. But once a young person has gone through months of training and begins to compete, the coaches let them know the same dedication works in school. At that point it’s easier to convince them that the same gradual effort at academic study can increase learning and improve grades. Such academic success, although different from boxing success, parallels it. Students start to enjoy academic learning and gain the skills necessary to succeed in life outside of boxing. It’s a residual effect rooted in the meditative concentration so central to boxing. Just as boxers engross themselves in the rhythm of the gym—the sound of the bags, jump ropes, sparring and pad work—they begin to engross themselves in the books and lessons that lead to good grades, graduation, and social confidence. That rhythm of the gym is something Russo agrees is part of the beauty of the sport.